In the Tumblr app, if you hit the search button on your profile a list of every tag you have used in a post will pop up. I deleted all the posts that contained the tags, but the suggestions are still there. I deleted the search bar completely on my PC but it is still there in the app. The answers is that deleting tag history is not supported. 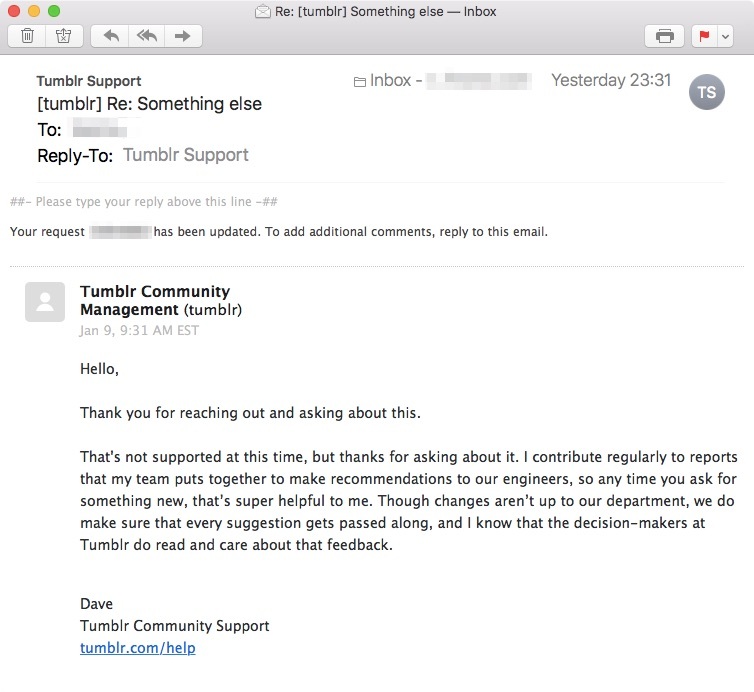 I also wanted to know if this is possible, so I contacted Tumblr Support to ask them. Thank you for reaching out and asking about this. That's not supported at this time, but thanks for asking about it. I contribute regularly to reports that my team puts together to make recommendations to our engineers, so any time you ask for something new, that’s super helpful to me. Though changes aren’t up to our department, we do make sure that every suggestion gets passed along, and I know that the decision-makers at Tumblr do read and care about that feedback. Not the answer you're looking for? Browse other questions tagged tumblr tumblr-tags or ask your own question.